The 5th generation of our legendary small block engines use three proven fuel-saving technologies — Active Fuel Management, Direct Injection and Continuously Variable Valve Timing — to deliver impressive efficiency with performance you can rely on. 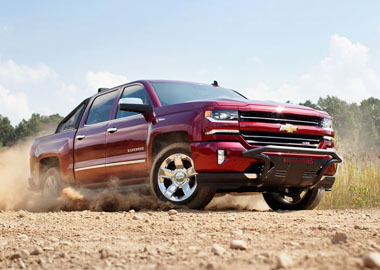 For an optimal balance between power and acceleration, Silverado offers an 8-speed transmission. The legendary Z-71 Off-Road Package provides real off-road capability from a tuned suspension featuring Rancho® shocks, skid plates and an automatic locking rear differential. With a Max Trailering Package offering up to 12,000 lbs. of class-leading V8 towing capability, Silverado is ready to haul some heavy loads. LTZ Z71 in Siren Red Tintcoat shown with available Off-Road Sport Package. 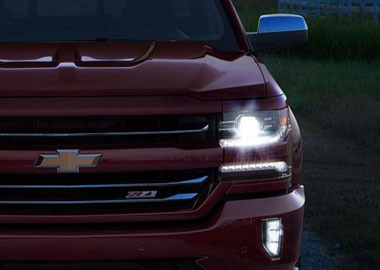 Silverado LTZ, LTZ Z71 and High Country feature full LED lighting package including LED headlamps, daytime running lamps, foglamps, park/turn signal lamps and taillamps. Triple-seal inlaid doors, an aerodynamic windshield and a tuned exhaust system reduce noise in the cabin, while dual-resilient foam seats offer long-lasting comfort. USB ports and an available 110V plug-in give plenty of options for keeping your compatible devices charged up and ready to go, no matter where the day takes you. Steering wheel controls let you answer phone calls, control the available Chevrolet MyLink display, change Driver Information Center settings, available cruise control and safety features. Silverado is the first full-size pickup to offer 4G LTE Wi-Fi®. The signal is more powerful than your smartphone and provides a connection for up to seven devices. Whether you’re streaming music through Pandora radio or using Bluetooth® to make hands-free calls, find directions, or access your playlists, the available Chevrolet MyLink will help keep you connected and entertained on the road. Silverado offers advanced safety features like Forward Collision Alert to help prevent a potential collision. In the event of an impact, a safety cage made of high-strength steel surrounds the occupants, while available OnStar® Automatic Crash Response can alert an OnStar® Advisor to dispatch emergency assistance on your behalf.